Since 1999, the use of digital and online instructional approaches known generically as ‘blended learning” and “hybrid learning” have become increasingly popular as a way to convert the brick-and-mortar classroom to a model that combines online education with more traditional education approaches. 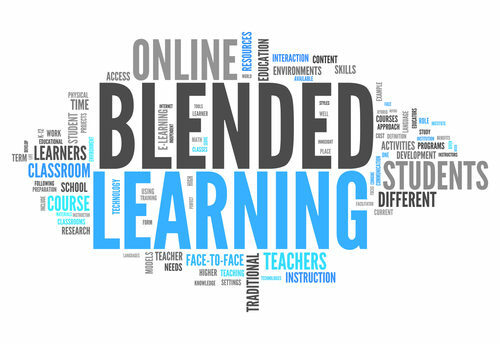 Generally speaking, blended learning combines classroom learning with online learning. Blended learning provides the opportunity for students to participate in the control of their individual learning time, pace and learning space. In a teacher-designed blended learning atmosphere, the classroom teacher makes the decision about which combination of classroom time and online time will work best for the class. The value of student-controlled or student-centered blended classrooms is a frequent debate subject among educators. If students are to effectively participate in developing their own learning models, they must know how to communicate, collaborate and solve problems in groups and individually. Dissenters say the process is too messy, loud and disorganized. Supporters of the concept believe that, in the end, the learning achieved is substantially more meaningful, to both students and teachers. CAN BLENDED LEARNING BE BETTER AND COST EFFECTIVE? Students in remote locations or unusual challenging situations can be offered access to quality educational resources at substantially reduced costs as compared to having to finance traditional brick-and-mortar facilities. Public school salary costs can be better managed by use of digital learning approaches that allow the increase of teacher-student ratios or via re-designed processes that create a more effective use of teachers’ time. For more information about how to use blended learning in your school and/or classroom and to review seven separate curricula suitable for blended learning models, or to access over 2000 courses, including more than a hundred available elective courses, visit Global Student Network for schools at http://www.globalstudentnetworkschools.com/ .